When I saw one of my favourite local beauty salons was hosting a makeup event I jumped at the chance to go along and pick up some tips and tricks from the professionals. 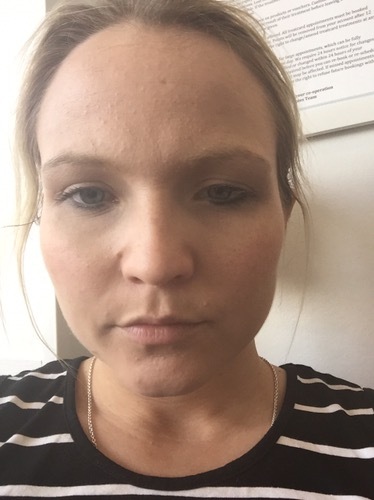 I have never really mastered the art of makeup application and with my skin suffering during this pregnancy, I felt I could do with a bit of a boost. My appointment was booked in for 6pm and I turned up around 20 minutes early and was greeted with the offer of a drink and given a seat in the waiting area. Shortly afterwards I was shown to the makeup chair by my makeup artist Anisa and put at ease with a short introduction to the company she worked for – The Institute for Anti-Ageing. 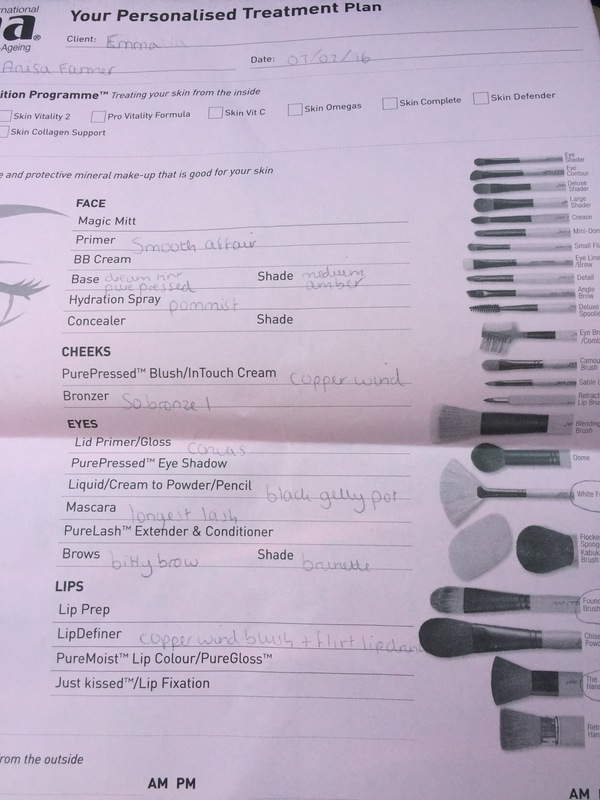 She explained that there were 3 steps to the company, which is the advanced nutrition programme (treating your skin from the inside), Jane Iredale Makeup (a mineral makeup range) and Environ (the skincare range). My appointment was focused on the makeup side of things and, after a couple of questions about my skin and skincare/makeup routine and products I usually use, Anisa got to work. Firstly we had to take off my existing makeup. I’m always ashamed at how much black and beige comes off of my face when I do that in public but Anisa was so lovey and unfazed. We discussed my pregnancy and plans for homebirth and she was really careful to say that some of the skincare products they have that would benefit my skin in the long term might not be suitable for during pregnancy and breastfeeding, which I thought was a sure sign of a professional, not willing to put my baby’s health at risk for a sale. Big thumbs up for me. Anisa started with a primer, moving onto a tinted moisturiser and a multipurpose mineral foundation/powder/concealer. I loved how smooth my skin looked from just a couple of products. 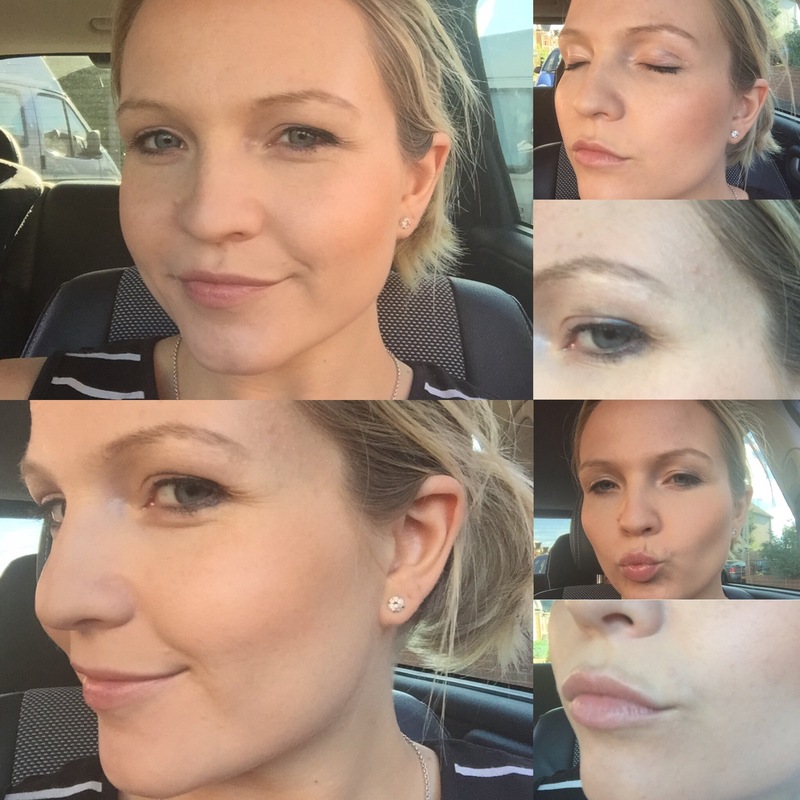 Using bronzer and blusher sparingly, Anisa worked her magic and lifted my usually dull and tired complexion. She explained every step of the way what products and brushes she was using and gave me general tips on the best way to apply my makeup, which in itself was so helpful as I’m a bit clueless in that area. A bit like when I’m taking photos where I point and shoot, with makeup I tend to just shove it on and hope for the best, and then wonder why I look rubbish. Moving onto my eyes, Anisa went for a shimmery primer on its own in place of an eyeshadow and used a subtle amount of eyeliner on my top and bottom lash lines before adding primer and mascara to my lashes. She then filled in my eyebrows in a slightly darker shade than I usually would, which really helped define my eyes. For my lips, she decided less would be more as we were going for an everyday look so she simply brushed on some of the blusher she had used earlier and finished with a ‘lip drink’ in ‘flirt’, which I loved. It was so soft, hydrating and the perfect shade of subtle pink. After we’d finished, Anisa took the time to go over all the products she had used again and wrote them on a handy sheet which I was given a copy of. There was no hard sell and when I decided I wouldn’t be able to purchase anything right away, I wasn’t made to feel pressured, which means I am more likely to come back and order in the future. I especially loved the primer as it helped give such a flawless base for the rest of the makeup. 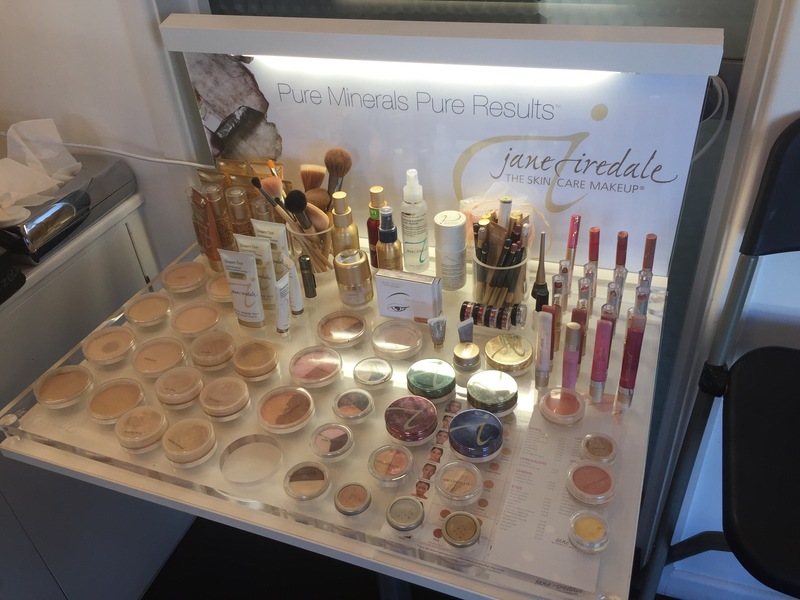 Jane Iredale makeup is stocked at Hi-Therapies and I would definitely say it’s worth coming along to any future makeup days they hold as it was really informative, a nice pampering treat and the deposit you pay can be used against any products you decide to purchase on the day, which is excellent value for money. Even better, plan a night out for afterwards and you’ve got the chance to show your makeover off (unlike me who just went home and lounged in front of the TV for the remainder of the evening). 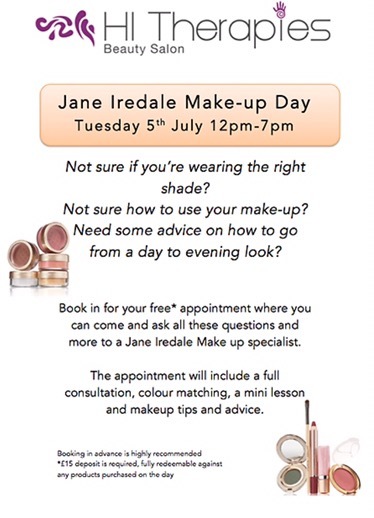 To enquire about when the next makeup day is or to discuss the Jane Iredale range in more detail, visit Hi-Therapies here.